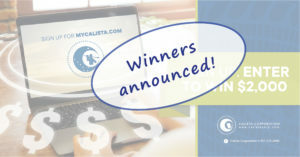 (Anchorage, Alaska) – Calista Corporation announces the winners of MyCalista & More Contest #2. The single grand prize is $2,000 and there are seven second prizes who will each receive a 9.7” iPad. Each iPad has an estimated value of $559 and features 128GB of memory with wi-fi and is cellular capable. Over 17,700 entries qualified for the contest. Entry options were having a valid stock will on file, registering for a free MyCalista.com account, opting for direct deposit, or opting for electronic delivery of Annual Meeting materials or the Storyknife newsletter. If a Shareholder with Class A or B shares passes without a valid stock will on file, Alaska State Statutes determine who will inherit the shares. With this method the process to transfer shares can take months or years. A valid stock will on file ensures your stock is transferred to the individual(s) of the Shareholder’s choosing and the time it takes to transfer stock can be greatly reduced. Digital options reduce paper usage. Direct deposit of dividends has added benefits over mailed checks, including no risk of lost mail or mail theft. All valid direct deposit entries will receive the upcoming Akilista dividend electronically. MyCalista.com is a free Shareholder web portal. Registration allows Shareholders at least 18 years old to securely access their Shareholder account. Address and phone updates can be made, dividend history can be viewed, and more. Calista Corporation was established under the Alaska Native Claims Settlement Act of 1971 and represents approximately 28,000 Shareholders. Calista is the parent company of more than 30 subsidiaries in the following industries: military defense contracting, construction, real estate, environmental and natural resource development, and oil field services. Calista can be found on Facebook and Twitter.